Baphia massaiensis is a shrub or small tree that can grow up to 10 metres tall. The tree is sometimes harvested from the wild for local use as a coffee substitute and for making toothbrushes. 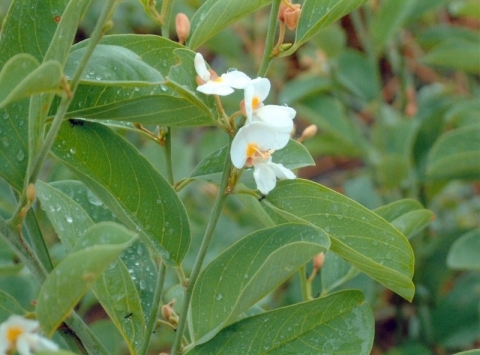 The plant is quite attractive, producing flowers in attractive short sprays, these are white with a yellow spot at the base of the standard petal, and are sweetly jasmine-scented. Africa - Tanzania, Angola, southern DR Congo, Zambia, Malawi, Zimbabwe, Mozambique, Namibia, Botswana, northern S. Africa.